Senyorita Lakwachera: Untitled love story. We first had a chance to know each other over coffee. Less we know, we are becoming a compulsion to each other on coffee breaks. Less we know, we are becoming a compulsion to each other on lunch breaks. We knew were close then when we first agreed to a trip. It was a stormy day – but nothing could stop us anyway. We sailed the sea of huge waves and strong winds. For some reason, we never felt fear, perhaps because we were with each other. It makes us realize how opposite we are in many things and perspective of some. Despite that, we still see each other back on the road together. We might fight and argue, but walking with each other still remains the last thing we want to do. It grew one day, bloom away without any condition or confirmation. To every place where we can build a treasure box of untitled love story. I’m in my mid 20’s and been to almost #'s of relationships before. All of which only lasted for four months at most. But this one whom I traveled with has been the longest – 5 years and counting. Five years of not just love, but also respect, acceptance and trust that we keep on learning while we held each other’s hand on the road. And if there is something very unique and fascinating on each and every destination that we’ve been - I would definitely say that it's us. 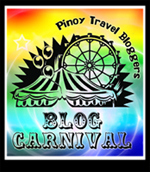 This post is my entry to Pinoy Travel Bloggers' Blog Carnival for the month of February 2014. Theme: "The JOYS AND WOES OF COUPLEHOOD ON THE ROAD"
Hosted by Claire Madarang of Traveling Light.